My girl Juliann can hook you up if you're looking to learn more about it! It's been tough getting back in the groove after taking the long weekend off. My relationship with Google Reader was a little touch and go there for a second, but I think I've finally been forgiven (it just took an hour of buckling down and reading all 48 blog posts I missed). I gotta say I'm loving these productive Wednesdays...! 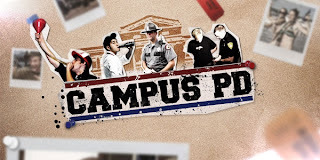 Everything about me indicates that I would hate a show like Campus PD, but for some reason, I enjoy watching a good arrest for disorderly conduct or public intoxication. It's 25% tragedy, 75% comedy. is from (apparently he's slightly famous, according to IMDB).